Almost all food magazines I leafed through today at the kiosk dedicate a section on soups as the perfect winter food. Rightly so, however I doubt if anyone would really sit outside, read a book and enjoy a bowl of soup in winter in the northern hemisphere anywhere above the 47° N latitude like a beautiful photo was suggesting in one of these magazines. I was waiting to board a flight around 4pm in early January in Helsinki and was looking out of the airport window. This was the time just before the evening darkness fell. My view through the frame was the dark blue sky, bordering black, a tick darker wall of forest on the horizon at the edge of the tarmac, a lonely yellow lamp not reaching past the gate, no other building in sight. The pressing "kaamos" (polar night, also referred to as winter tiredness) was only interrupted by an occasional plane rolling in to its gate somewhere. It was dark. Time for a bowl of soup with two winter vegetables: white fleshed swede and celeriac. 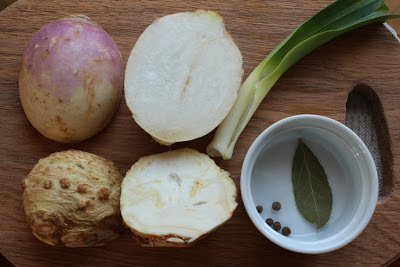 Swede is known as rutabaga in North America. 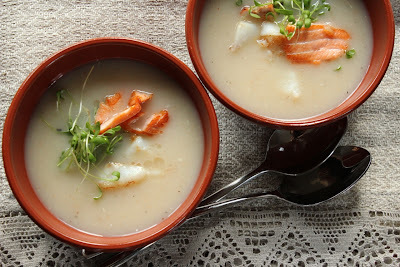 If you are sensitive to the slightly bitter taste of swede then in the combination with the sweet note of celeriac that bitterness is not felt at all. Cut the celeriac and swede into small cubes and place in a pan together with a bay leaf, grains of allspice, leek and add the stock. Cook for about 10 minutes until the vegetables are soft. Remove from heat and take out the bay leaf, allspice and leek. 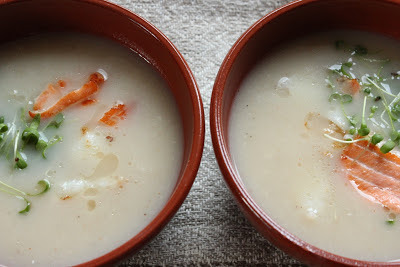 Using a blender or hand mixer purée into a soup. Season with salt and pepper and mix in the cream. 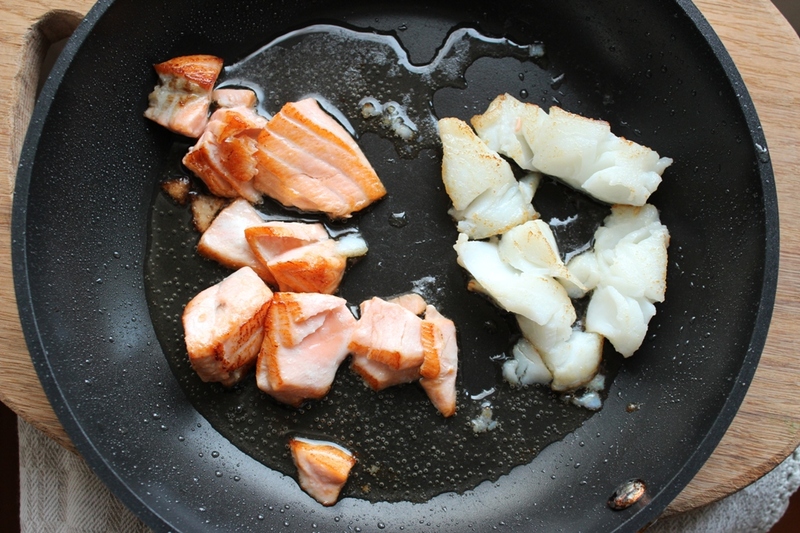 Heat the oil in a pan and fry the fish for 3-4 minutes turning sides. 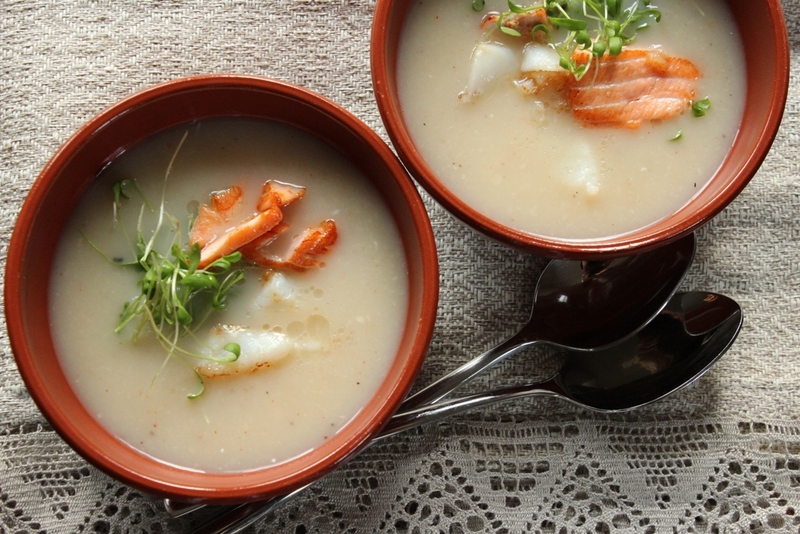 Serve the soup with chopped cress and portion the fish directly at serving. Also tastes great without the fish as a vegetarian option.